I happen to be a huge fan of the widescreen film format, which, in various incarnations, is the standard of choice for motion pictures. In this format, the film is projected in a ratio that is rectangular, rather than square. But widescreen has not always been in vogue. 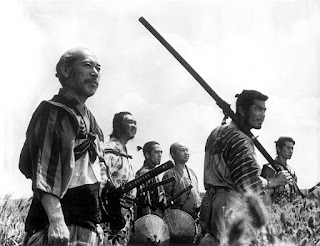 Last night I watched Seven Samurai, one of Akira Kurosawa's most heralded films. Seven Samurai has a non-widescreen ratio. It is slightly rectangular but not by much. So although there is a slightly rectangular shape, it pales in comparison to other widescreen formats, such as CinemaScope. 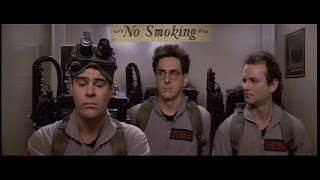 Here is a frame from Ivan Reitman's opus, Ghostbusters. It is in anamorphic widescreen format. Please note, depending on the movie screen, there may or may not be the black bars at the top and bottom of the screen. Anyway, I've been thinking it's time for a new format. In fact, I think the whole 4-sided approach is tired. 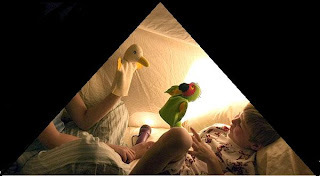 I therefore am supporting a move to TriVision, a triangular format which I have invented. I have converted the recent tour-de-force, The Nanny Diaries, into this format, and it works quite well.